That exceeds a target of 28 percent of its lending volume being climate-related by 2020, the group highlights. The climate finance target was a key aspect of the bank group’s Climate Change Action Plan, which it adopted in April 2016. 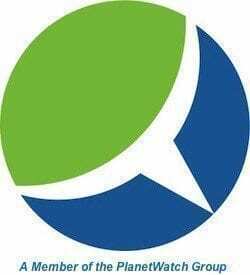 The plan is designed so that the World Bank Group supports developing, under-developed and lesser developed nations worldwide to achieve the national goals they have set as signatories to the UNFCC Paris climate change agreement. 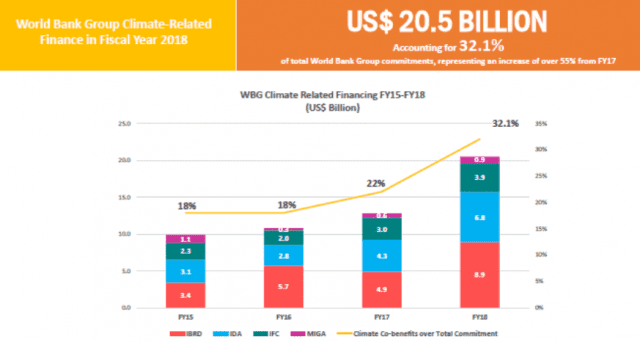 The World Bank Group’s two main lending arms – IBRD and IDA – nearly doubled the share of projects expected to deliver climate co-benefits over the past two fiscal years. That figure rose from 37 percent in FY2016 to 70 percent in FY 2018. World Bank financing in developing countries for climate change adaptation and resilience rose as well. In total, the development bank group’s climate change adaptation investments rose to $7.7 billion in FY’18 as compared to $3.9 billion the previous year. Nearly half – 49 percent – of the World Bank’s climate finance is now devoted to adaptation as opposed to climate change mitigation. So-called “climate-smart” investments by World Bank Group member International Finance Corp. accounted for 36 percent of total investments in FY18 – more than $3.9 billion. The IFC focuses on private sector finance and development in emerging markets. “The lion’s share of economic growth is taking place in emerging markets, and at IFC we recognize that we must ensure this growth is inclusive and sustainable. This is a trillion-dollar investment opportunity,” said Philippe Le Houérou, IFC’s Chief Executive Officer. Looking forward, the World Bank Group intends to announce new climate finance targets at the UN climate conference scheduled to take place in Poland this December. These will extend beyond 2020 and raise the group’s commitment helping countries reduce greenhouse gas emissions and be better prepared to weather the increasing variety and intensity of climate-change risks and threats they face, the bank says.